19 Pages: Home, about, solutions (with custom Paypal form), contact form, site map, resources, clients, PDF downloads, 6 Lytebox galleries, gallery & slideshows directories, thanks pages. Features: Css drop menus, 5 quick change color themes (white, black, blue, gray, latte), Paypal cart or no cart gallery option both included, auto watermarks, homepage jQuery slideshow animation, Optional no animation homepage. Details: HTML5 / CSS, JPG images, plain text or graphic header. 72 gallery images (expandable). Mobile: Includes 13 page integrated mobile website: home & optional home, contact, about, resources, solutions (with Paypal), PDF downloads, 6 galleries, thanks page. Mobile Overlay Detection: Css overlay automatically detects for mobile browser width and displays a link box for the mobile version. View overlay details. 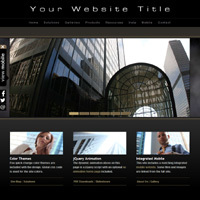 Drop menu business websites for art and photography with mobile sub-site. 5 quick change color themes. Edit with Notepad, TextEdit, Exp Web, DW or any HTML or text editor. Works with any web hosting. Each design on this page includes an integrated mobile website with a css detection overlay. Some elements, gallery images, PDF files and global scripts and colors are setup concurrently on the full site and mobile site. The mobile website, as well as the full site are both included in the download. The mobile sub-site is located inside a separate folder and is linked to the full website. Step by step instructions and support are included. See mobile sub-site details. Each photo web template design is developed using all standard .jpg images that can be either edited or replaced with your own .jpg images. 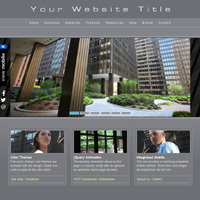 The homepage includes a mobile friendly jQuery slideshow using standard .jpg images. 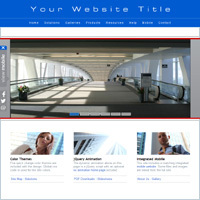 Css3 mouseover effects are achieved in each photography web template design through the use of a CSS style sheet. The CSS file is plain text and can be edited using any plain text editor. See the web template tour for more details. Developed with basic HTML code, all photography website template downloads will include all source files and code used during development. Also included are comprehensive web building help, web template support access and comprehensive targeted email help and support. Designs can be ordered with or without hosting and can be used to build your website using any web host company on any server type like Linux, Unix, Windows and others. Fully complaint with all modern, as well as most older and less popular web browsers like: IE, Safari, Chrome, Firefox, Opera, etc. Tested and compatible with iPad, iPhone, Droid, Blackberry, popular tablets, netbooks, laptops and Windows and Mac environments. See our FAQ for more. 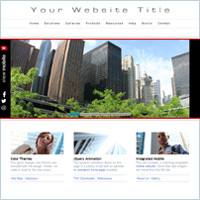 Unlike photography web templates offered by other companies, Allwebco website templates are complete sites, built with multiple pre-formatted webpages already included. Contact forms, dynamic image galleries, PDF downloads, about us, services, testimonials are just a few of the included pages. Scripts are already setup in the design and all website templates use plain text global menus so you can easily add new pages without any graphics editing required. See our features page for more details. SEO (search engine optimization) meta tags and other code are pre-built into each design so you can have a professionally optimized website just by editing these tags with your product or service information. Once edited your site will list in search engines just like a professionally developed website. 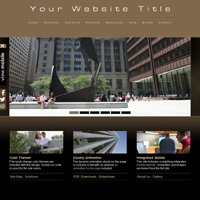 Our designs are Flash-free HTML5 / CSS built "complete" web templates. Every Allwebco photography web template includes a 30 day money back guarantee with no questions asked. Designs can be traded-in within 90 days and we will include 100% credit on the original purchase price. Updates are totally free for the life of all sites. When any photo gallery website template is updated by us, you can request a free download with the updates. Free website template add-ons and upgrades are available through our template support website that includes over 300 pages of help and website setup and development ideas. Paypal and 2CO shopping carts are built right into most of our photography web templates and they can be used to offer items online for purchase through your website. Paypal merchant accounts are free to create and there is a small charge to setup a 2CO account. You can add options to the Paypal forms to include a selection for size, color as well as other options. View options support. Exclusively sold on the Allwebco Design Corporation site, business photography web templates are not offered anywhere else.